A SIGNING EVENT was held by Missouri State University-West Plains for its new manufacturing technology and manufacturing management apprenticeship programs at the Greater Ozarks Center for Advanced Technology (GOCAT). The apprentices will be mentored by officials at Leonardo DRS in West Plains. On hand for the signing were, front row from left, manufacturing technology apprentice Daniel Truman, Koshkonong; manufacturing management apprentices Jodie Pounders and Gary Drown, both of West Plains; and DRS Senior Human Resources Director Garland Barton. Back row: Manufacturing technology apprentices Shelby Barton and Jennifer Amyx, both of West Plains; manufacturing management apprentice Jackie Callahan, West Plains; and DRS Vice President of Operations Steve Foster. (Missouri State-West Plains Photo). The two-year programs include academic instruction and on-the-job training. Officials at Missouri State University-West Plains hosted a signing event Monday, March 18, for six students in the first cohorts of the manufacturing technology and manufacturing management apprenticeship programs offered at the Greater Ozarks Center for Advanced Technology (GOCAT) in West Plains. This continued venture by Missouri State-West Plains into U.S. Department of Labor certified registered apprenticeships follows on the heels of the university’s first ever apprenticeship signing in January. Funded through a Missouri Registered Apprenticeship Grant from the Missouri Economic Development Division of Workforce Development, it brings together a coalition consisting of Missouri State-West Plains, GOCAT, the South Central Workforce Investment Board (SCWIB), the Missouri Department of Economic Development, the Missouri Registered Apprenticeship Program, the U.S. Department of Labor, and four local businesses. 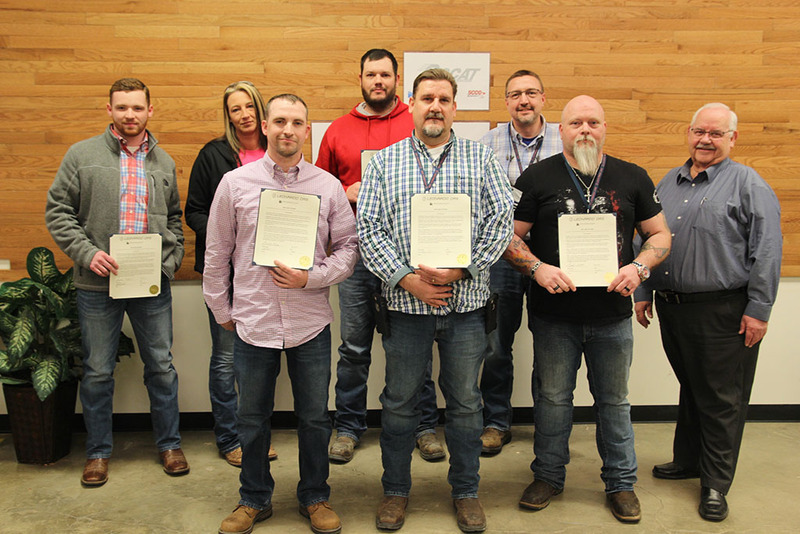 The manufacturing technology and manufacturing management apprenticeship programs are layered, two-year programs that consist of related academic instruction and on-the-job training with mentors at Leonardo DRS in West Plains. The apprentices will be trained in various areas of manufacturing and required to meet competencies in order to gain credentialing from the U.S. Department of Labor, officials said. “We are very excited to be able to collaborate with Leonardo DRS to develop these additional apprenticeships,” said Sheila Barton, Missouri State-West Plains workforce manager at GOCAT. All candidates were selected through a screening and interview process by Leonardo DRS officials. Leonardo DRS will provide the work experience to ensure professional skills while Missouri State-West Plains will provide the classroom training. The eight-week blocks of coursework over a period of one year, in conjunction with on-the-job training to refine the skills they have acquired, will provide opportunity for short- and long-term career growth, as well as salary increases during and after completion of the apprenticeship and as specific milestones have been met. For information about the apprenticeships, contact Barton at 417-255-7784 or sheilabarton@missouristate.edu, or Roy Crouch, Missouri State-West Plains education/outreach specialist at GOCAT, at 417-255-7785.